Okay friends... I have to get focused on my goal! "The only difference between a wish and a goal is a PLAN." I need to get a plan and follow it! Today I was up 0.8. Ugh. Guess that is what happens when you change your weigh in day from the day after cardio to the day after weight lifting. Oh well, that is now behind me and I will move forward. I am frustrated that I am still up 2 lbs from my lowest weight in 2008 on 12/23. I swear if yall hadn't been so kind about my picture that I posted on Tuesday I would be a puddle of tears. By the way, thank you for all of the complements! I almost didn't post the picture because my face was shinny (I had been to my weight lifting class right before the shower and just "freshened up"), my muffin top was hanging out (as always...), I thought I looked terrible and then yall were so very kind. So, thank you! Alright, since the 20 in 20 worked out for me last time... I am going to use that goal and plan again. I have my work cut out for me because I am starting this as week 1 and I am up .8. I can do this... I will do this. When I reach 20 in 20 I will be 4 lbs below my max weight that WW says I need to weigh so I will be at LIFETIME when I finish this 20 in 20 mission! If I am counting right, June 12 will be week 20....just in time for me to buy a new swimsuit (last years will fall off...not pretty my friend, not pretty) to take on our vacation to the beach! Okay, I NEED you to cheer me on again! Want to join my quest... let me know and I will cheer you on too! I wanted to introduce you to my friend Kristin's darling little boy....Ryan. Ryan was born this morning and weighed in at 7lbs 4oz and was 20.25" long! Mom and baby are doing great and Big Sister Hannah is smitten. I got some very cute pictures of Hannah holding her baby brother and it made me think about this moment I was able to capture not long after we had James. Tonight when I got home from visiting them at the hospital Kirstyn couldn't wait to see the pictures. She oohed and awed about how cute he was and then she said, "I'm really glad that Hannah got a boy one too...now maybe James can be friends with Ryan and leave me and Hannah alone when we play dress up." I said, "maybe." The truth is...these little brothers are just at the beginning of the trouble they will cause for their big sisters! Enjoy hot cocoa and marshmallows. Set up tent for kids to play in because it seems like a great idea. Take down tent because it becomes a source of contention. Look at ice sickles on playground from just inside the warm house. Clean out the kids drawers and reorganize their clothes. Dress yourself (check out James' outfit! He insisted on these clothes while I was trying to clean out his drawers)! Wish I hadn't fed the kids the last of the blueberries for breakfast because I would like to make this recipe. Make Whole Wheat Chocolate Chip Pumpkin Muffins instead! note: These are sticky because they have no fat in them. I do not recommend using the little paper cups. The only fat in these is from the chocolate chips. You could reduce the amount used or eliminate them all together. Makes 12 muffins at 2 WW points each! Turns out the old Thursday Thirteen blogroll is not working...but fear not, you can link up here! For years my sister, Neida, and I have told our mom that when she and daddy are dead and gone, we will just take a box each, get what we want out of the house and then have it burned down because it would be too expensive to have someone haul it all away. That may seem harsh but my parents have lived in the same house for about 35 years and in that time my mom has taken a few car loads to Goodwill but other than that, they have carefully stored everything away "in case they need it". Well, Neida and her family are moving back to Texas this summer and Neida is having an auction at her house next month to sell all of the furniture and other items that she doesn't plan to move. She has been telling my mom to pack some things up and bring over to her house to put them in her auction. My mom had proudly packed up two boxes.....not even a dent. Neida and I were sitting in the kitchen talking when for some reason we decided that we would clean out my mom's built in hutch in the breakfast room and see if we could find anything else to take over for the auction. Well, we got on a roll and spent ALL day on Saturday filling boxes and trash sacks for the auction. We oohed and awed at some of the things we found (my Popples lunch box!) and had a great time discussing vacations we had taken (Dixie Stampede Souvenir Cups, Disney water bottles). My mom spent time trying to remember who had given her the electric fondue pot (that was still in it's original box!) as a wedding present! And we laughed....oh how we laughed. The almost pee yourself laughter! We found 7 different coffee pots - just the pots, as the coffee makers have long since died. Public Service Announcement: a coffee maker when used every day has a life span of approximately 5 years! Now, check out the 1970's seal-a-meal and the unopened freezer bags. And then we discovered the drawer that contained all of the instruction manuals! My Western Auto bicycle, my dad's lather dispenser that died before I was born, the waffle maker that my mom got as a wedding present and is still using. Now for my last public service announcement: if you build a house with amazing amounts of storage, you will hang on to way too much! My parents live in a very well designed house with great built-ins that holds large amounts of stuff so they can be hoarders and live in what appears to be a spacious clutter free home.... just don't look in the corner cabinet or the extra walk in closet or the basement...oh the basement! Neida and I have decided that mom and dad will have to take the 4 grandkids and go camping for a weekend while we empty the basement. With any luck, Neida and I will help them get ready for retirement one day....in Texas! And I will get some awesome blog material! Oh, and this is definitely a WORDFUL Wednesday! Okay, well I have finally made a decision! I am changing WW meetings and will be going on Friday mornings at 7am. So, my weigh in confession post will be on Fridays. I weighed in on my home scale this morning just to see where I am (after all, we spent the weekend at my moms and on the road) and I was down close to 2 pounds! I hope the Friday morning weigh in is just as kind to me! I also went to the gym this morning for a weight lifting class as there is an ice storm on the way and I won't be able to get out and go tonight. In other news, I had a baby shower a few weeks ago for my friend Kristin and I wanted to share a couple of pictures (look how cute the diaper cake I made turned out!) and the punch recipe that turned out to be VERY popular! Now for the punch recipe that I of course reworked to lower the points so I wouldn't feel so bad about tasting it. Everyone loved it and seemed very surprised when I told them that it was a leaner version. I'm still here. We had some great weather here last week so we spent much of our time playing outside and then on Friday we made a last minute decision to go to Arkansas to see my parents for the weekend. We had a great time and I will tell you more about our trip later this week. On January 18th, MiMi (David's mom) celebrated her 60th Birthday. We took her out to Joe T. Garcias for lunch to celebrate. Her favorite dessert is flan and that is one of their specialties there so that is one of the reasons that we chose to take her there. We ate in one of the inside rooms in the garden part of the restaurant because it was so windy that day. Kirstyn really enjoyed giving MiMi and Grandpa a tour of the garden. I even captured a rare picture of Grandpa and Kirstyn walking hand in hand. I can't ever get these guys to pose for a picture but at least I got a shot of them. Lately, my challenge has been getting Kirstyn to NOT pose for every picture I try to take... I give up. Say a quick prayer for Grandpa, Ned, today as he is having another surgery on his hip this morning. I am happy to report that today I was down 2.2 lbs! Yeah! I expected more, but hopefully I will see more pounds come off next week. I talked to one of the weigh-in ladies this morning and found out that she actually does the hiring for my WW center and she said that there would be a job for me (probably starting out in reception) but that I would need to stick with attending a meeting to have a better chance of eventually getting my own meeting. I am going to take her advice and try out some other meetings. I'll keep you posted. I may have to change my Tell All Tuesday to a Fat Loss Friday but I will still be posting my weigh-in results and getting much needed encouragement from all my fabulous readers! Thought I would share with you one of the many conversations that took place around our house today. Kirstyn: What is after bed again? Me: We are going to go to mommy's meeting (weight watchers) and then we are going to come home and watch the inauguration. K: What is an in-ag-ra-vation? Me: Another subject, tomorrow is the inauguration. Me: We get a new president and he gets to move into the White House. Me: Because it is someone else's turn. You can only be president for 4 or 8 years. Me: Did you know the other one's name. K: No, but I don't like it when people have to move. Me: It is okay. I'm sure President Bush is excited about his new home in Texas. K: Are we getting a girl? Me: No, not this time. K: Bubby, we are getting a new president, but its not a girl. K: Bubby, we are going to watch the in-ag-urrrr-vation. So, will you be watching tomorrow? I am going to poke around some blogs to see if anyone has good teaching crafts and activities for me to do with my kids tomorrow. No matter who you voted for, tomorrow is a great teaching opportunity! I remember watching the first President Bush being sworn in on tv at school. I was also at the Arkansas Governors mansion for President Clinton's second election party. Then in college, I stayed up all night long waiting to see if Bush or Gore would be elected. What political moments stand out in your mind? I never got around to doing an "I Resolve" post so I will tell you a little about what I want from 2009. See 2008 was about my battle with my weight. I have not finished that battle, but everything is in place to succeed and maintain so that is not my number one focus anymore. I decided to focus more on my family. To spend more time playing and focusing on my children individually (Kirstyn starts Kindergarten in 2009...agh!) and to spend more time focusing on mine and David's friendship and our marriage. 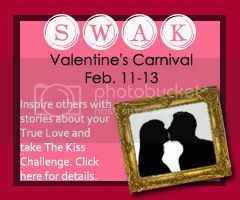 And then today I found out about this Valentine's Carnival over at We Are THAT Family. I think it will be fun to read every one's stories about their True Loves and I might even win a prize. Go on, plan to join and lower my chances of winning... it's okay, really. So, anybody got any ideas for inexpensive date nights? Also, do you take your kids on "dates" to spend one on one time with them? This is my adorable nephew, Bryton. But at my house he is known as ThatThat! When we went to Arkansas for Thanksgiving, James and Bryton (who is 6 months younger than James) got to spend lots of time playing together. Bryton is an even match for my little aggressive James. James spends a lot of time telling you to "LOOK" while Bryton points at things he wants and says "ThatThat". So now if you ask James, what does a cat say? James says MEOW. What does a cow say? MOO. What does Bryton say? ThatThat! Too funny!!! Bryton is going in to the doctor today for chest x-rays to see if his pnemonia is better. Pray this sweet boy makes a speedy recovery and doesn't have to have a hospital stay to get better this time. For more Wordful Wednesday head on over to 7 Clown Circus. I am embarrassed to tell you that I posted a 0.4 gain today. I know that is not much and I am sure that it had a lot to do with the high sodium dinner I had last night but still, it is frustrating. I expect a good loss next week! On another note, I am going to change my membership with Weight Watchers from going to meetings to on-line only. My beloved WW leader retired and I am not really 'clicking' with the new leader. I am also at a place for the first time in my life where I KNOW I can trust myself with my weight. I have developed myself a huge circle of accountability that I didn't have a year ago anywhere but at my WW meeting. I now spend around 10 hours every week in the gym working out in group fitness classes (with several of my WW buddies). That encouragement goes a long way! I actually had a woman last night (that I don't know) come up to me and tell me that I have amazing legs. WOW. Thanks. And thank you Body Step! Now to get rid of the muffin top so that I can have amazing abs! Okay, promise me that you will keep cheering me on! And if I stop posting Tell All Tuesdays then you need to stalk me!!! Okay, now I need to set a goal. I am going to lose 15 lbs between today and March 31st (hopefully that will also mean that I will be carrying 10lbs less with me across the finish line at my 5K on Feb 28th). That give me 11 weeks. Just think, by July when we go to the beach I will be at a TONED goal weight and I won't have to wear a giant t-shirt over my bathing suit to play with my kids in the waves! We went to the zoo between Christmas and New Years when our friends were in town visiting and had a great time. My favorite part about the adventure was playing with my new camera and being able to capture moments that I have never before been able to capture (my other camera was way too slow!). I can't wait to see some of the pictures that Rebeka took at the zoo because I might actually be in some of them! I just love the look on James' face in this one! The last time I took him in to feed the birds he was a little spooked by them and I didn't get to take any pictures because I was holding him. Kirstyn was also very proud that she was able to get two of them to eat at the same time. 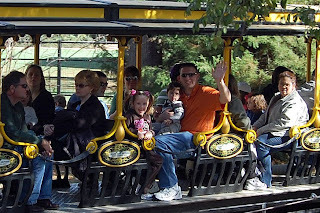 When they road the train, I decided to get a little extra exercise and make it easier on everyone by walking back to the front pushing the stroller and pulling the wagon. I stopped along the way and waited for them to come by on the train so that I could snap a few pictures from a distance! And wow, just look at these animals. They look like they are looking right back at me! Now I know why there are so many people wandering around the zoo with tripods and huge cameras. It is so much fun to try to capture just the right shot! I can't wait to see improvements in my photography skills the next time we venture out to the zoo! Okay, I have both good and bad news! Bad news: I have tons and tons of really awesome pictures and NO GOOD PLAN for storing and backing them up! So, back to the good news. I have been whining for talking about getting a new camera for a year now and apparently my family was paying attention! See, no one was planning on spending THAT MUCH money on me for Christmas so they all banned together and gave me money that was specifically earmarked for me to purchase myself that new camera. My mom gave me money, my sister gave me money, my grandparents gave me money, my in-laws gave me money, an uncle sent me money, David's brother and sister in law gave me money....you get the idea, they had all banned together with David to make sure that I could get my camera. YEAH! I was so excited when the total finally made it to the sale price of my camera (We were actually able to buy it on the 23rd and David let me 'open it' on Christmas Eve so I could have it to use on Christmas Day)! So, now back to the bad news that YOU my WONDERFUL reader can help me turn into good news. My current picture organization system is simply to download to computer and backup on CDs. It is sloppy and slow at best. So, my question for you is, do you use an online backup system? How do you organize your pictures? Please help...tell me the method to your 'picture madness'! On the weight loss front I have nothing to be proud of because today I was up 4.4 pounds. I know for sure that some of it is due to how incredibly sore ALL of my muscles are. See, my legs were really sore from the 5K on Saturday so when I went to my weight lifting class on Sunday, I went ahead and increased all of my upper body weights! Agh. I hurt! And the rest of the gain, I have no one to blame but myself...but I will say that I had a fabulous 30th Birthday and my cake was very good! I promise not to order another birthday cake for myself until I turn 40! In other news, today is mine and David's 8th wedding anniversary. I thought I would share one of my favorite "love is..." cartoons. These cartoons are very special to me because David cuts them out for me all of the time and then I find them at just the right times. I know he will never let me down and will love me no matter what I look like...after all, he thought I was pretty even when I didn't agree wearing my size 22 wedding dress. We are both happier now that I have some self confidence! I love you babe! Thanks for believing in me way before I believed in myself! Happy Anniversary! I can't believe it... I am being featured this week as a Saucy blog! So, if you are a SITS-ta here for a first time visit, I wanted to take a minute to introduce you to my blog and what is really Normal to Natalie! Every Tuesday I post about my Weight Watchers weigh in. I love the accountability that it brings me and the much needed encouragement that I get from my loyal commentors! I posted before and after pictures when I lost 50 pounds and then I just finished my 20 lbs in 20 weeks mission and posted pictures again! My kids James (19 months) and Kirstyn (5) are also a big part of my blog. My husband David is my best friend and the love of my life. He works very hard to take care of our family and make sure that I can be a stay at home mom. Thanks for being my friend... and please COME BACK AGAIN! Okay, I completed my first ever 5K today. 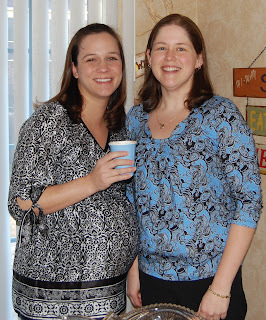 It was so much fun because all 8 of our playgroup mommies jiggled it together! Here we are before the race in order by faces Elaine, Tracy, Jenn, me, Claudia, Jennifer, Michelle, and Carrie. My goal was to complete it in under 40 minutes and my time was 35:10! I let myself walk to long toward the end and I had some trouble with my breathing due to allergies but all in all I am pleased with myself. Since I never run I wasn't really as prepared as I should have been.... Not to worry, I will be more ready for next time! Yes, next time. We are now all planning to do the Cowtown 5K together on Feb 28th.